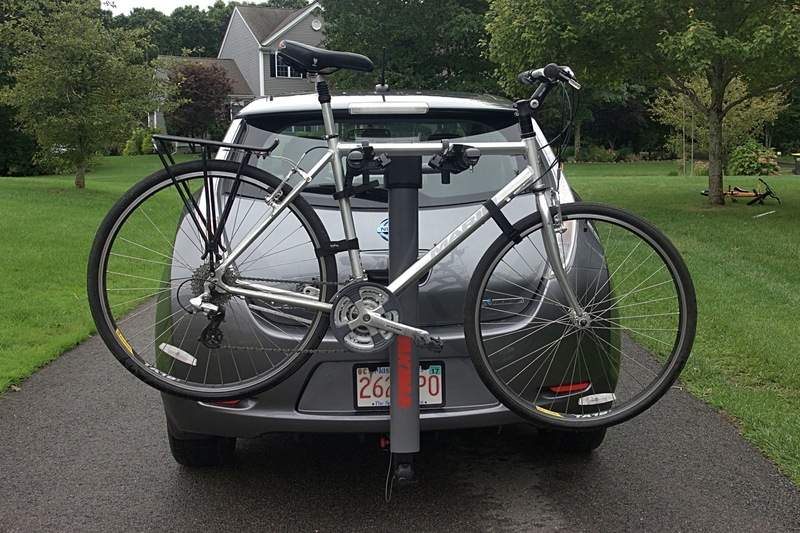 I used my Nissan Leaf “range extender kit” (aka bike rack) for the first time today. It consists of the CURT 11396 Class 1 Trailer Hitch Receiver and the Yakima LiteRider 3 rack. I first tried the Yakima FullBack attached directly to the Leaf’s hatchback. It works, but it needs to be attached in “anchor mode”, which wrecks the Leaf’s headliner. Also, it was kind of a pain to put on and remove, and it significantly interferes with rear window visibility if you just leave it on when it’s not in use. The expense and complexity of adding a hitch receiver was well worth it. The LiteRider is very easily to put on and take off, and when you leave it on, it barely affects rear window visibility or the Leaf’s backup camera. Also, the CURT receiver is made specifically for the Leaf and is barely noticeable when not in use. Most of it is hidden away under the Leaf’s plastic shielding, which, along with better aesthetics, hopefully limits the negative impact on aerodynamics when nothing is attached to it. I can’t overstate how much fun it is to throw the Leaf on a free charger and switch to bike mode.